Wasp nests can be virtually anywhere. This nest was in a Blue Spruce. They also build nests in White Pines and Austrian Pines. 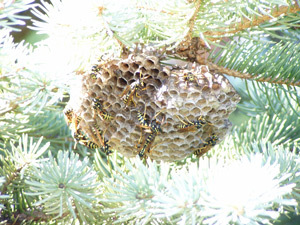 Many wasp and hornet sprays are petroleum based and can damage trees and shrubs. With the Gotcha Sprayer you can position the spray right in front of the nest and isolate the majority of the spray right on the nest. The Gotcha Sprayer is especially good for wasp and hornet foam sprays. The foam will stick to the nest and minimize the amount of chemical that gets on the trees. Landscapers could easily be stung while trimming trees, shrubs or even cutting grass. The top nest was about 6 foot off of the ground and was less than 2 feet away from my head when I noticed it. 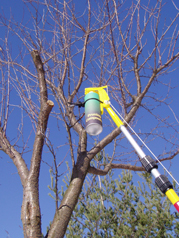 The Gotcha Sprayer is great for spraying aerosol pruning compound on freshly cut tree limbs to prevent disease. Many damaging insects are attracted to the sap and borrow into the freshly cut branches ultimately killing the tree. This is especially true in southern Texas where Oak Wilt is a real problem. Sealing the freshly cut branches, greatly reduces the spread of Oak Wilt.